Frank Duveneck (October 9, 1848 - January 3, 1919) was born in Covington, Kentucky, outside of Cincinnati, Ohio, in 1848. He received his formal training in Munich at the Bavarian Royal Academy during the early 1870s, and established his own school there in 1878. The following year, Lizzie Boott and her father Francis, both expatriate artists from Boston, were among Duveneck’s students. Through the early 1880s Duveneck courted Miss Boott, who lived with her father at the Villa Castellani in Bellosguardo, outside of Florence. He also traveled extensively during this period, from Munich to Florence, England and possibly the United States. During a visit to Venice in 1882, Duveneck’s work began to display a radical shift from the academic training he had received in Munich. Unlike his earlier interior compositions, which were often executed in dark tones with heavy impasto and thick varnish, his paintings from the latter half of the 1880s demonstrate his growing interest in recording the variance of natural light in the landscape. Painted in 1887, Siesta demonstrates this shift in Duveneck’s palette and subject matter. “by May 1886 he was back in Florence at Villa Castellani, availing himself of the local models that his wife hired and often sketched with him. At this time Duveneck began a sequence of canvases that emulated the idealized peasants of the Paris Salons, particularly those of Bastien-Lepage. 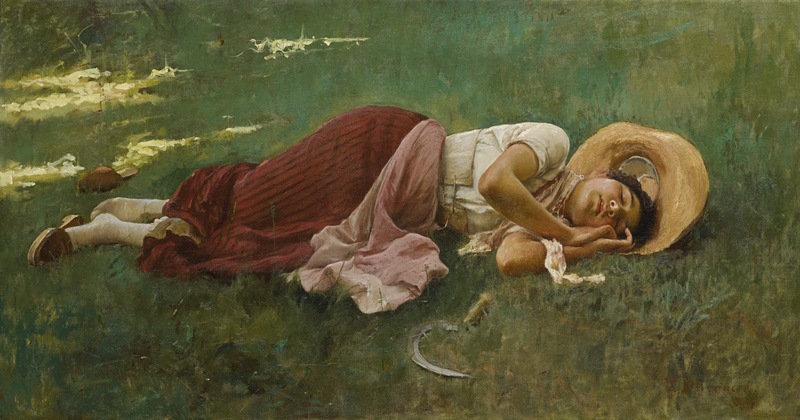 Two of these…[including] Siesta, featured a young, dark-haired girl posed in the fields behind Villa Castellani. She wears a peasant’s costume of Duveneck’s own devising: a Venetian scarf, skirt and mules…and a wide-brimmed straw hat” (Diana Strazdes, The Lure of Italy: American Artists and The Italian Experience 1760-1914, New York, 1992, p. 415).